Following up from some of their other mostly store exclusive cereals (like the Golden Girls one) Funko has now announced a new specialty line of “Saturday Morning” cereals for Designercon. 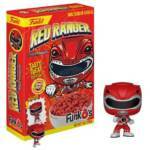 This line-up of exclusives includes FunkO’s Red Ranger Cereal! DesignerCon exclusive FunkO’s cereal will be available at the booth! The lineup includes Freddy Funko, Marvin the Martian, Skeletor, the Red Power Ranger, Rugrats, Hong Kong Phooey, the Amazing Carlos, and a very special collaboration with Be@rbrick! All DesignerCon exclusive FunkO’s cereal boxes are limited to 1000 pcs each except the Be@rbrick, which is limited to 3000 pcs. 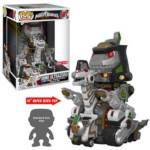 A plethora of new Funko Pop vinyl figures from Mighty Morphin Power Rangers was revealed today, and as you might’ve guessed from the title: these new Pop vinyls are the massive Dino Ultrazord, Tigerzord, along with a group of villains: Lord Zedd, Rita Repulsa, Pudgy Pig, and Pumpkin Rapper taking center stage. 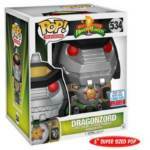 Meanwhile, the large-scale Dino Ultrazord Funko will be exclusive to Target, and the Tigerzord will only be sold at Hot Topic. Finally, we have a set of helmetless Mighty Morphin Power Rangers team these six are the only ones that will be released at mass retail. 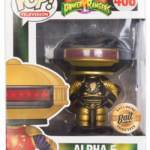 › Companies: Funko › Characters: Lord Zedd, Rita Repulsa, Tigerzord, Pumkin Rapper, Pudgy Pig... › Show: Mighty Morhpin Power Rangers › Toyline: FunkoPOP! Exclusive to this year’s Power Morphicon convention is a black and gold repaint of the Mighty Morphin Power Rangers Megazord POP! Vinyl from Funko. Release details have yet to be revealed however the item will go up for pre-sale for those who have pre-registered for Power Morphicon on Monday, June 25th via the Official Power Morphicon website. 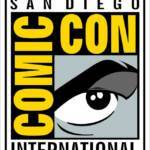 Power Morphicon is the official Power Rangers convention and will be part of the 25th Anniversary celebration for the Power Rangers franchise this August 17th thru the 19th in Anaheim, California. If you have not pre-registered yet, please click here to begin the process. New York Comic Con 2017 is only a month away and Funko POP! has taken it upon themselves to reveal some of their show exclusives! Coming to you at the big apple is none other than the over-sized Dragonzord (it will go well with your SDCC 2017 Megazord), a black and gold version of the Dragonzord, and a glow-in-the-dark Green Ranger! Check out the images by clicking the title of the story. NOTE: The black and gold version of the Dragonzord is a ToyTokyo exclusive. Meaning if you’re not in New York City … good luck! 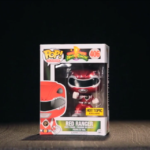 In case you didn’t have enough items to collect for Mighty Morphin Power Rangers, Funko announced yesterday some new collectible items that can line your shelves in all their retro-glory! 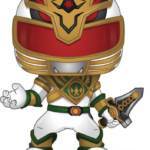 Announced officially were Mighty Morphin Power Rangers Pint Size Heroes – featuring all 7 Mighty Morphin Power Rangers, Goldar, Rita Repulsa, a Putty, and Alpha 5. These items are blind-bagged. We also got to see some new Mighty Morphin Power Rangers pens – featuring the Red, Black, Blue, and Yellow Rangers. Also officially shown are the action-poses FunkoPOP! figures of the Mighty Morphin White, Red, and Pink Rangers – with Pink and Red also being metallic with their Ninja Coin emblems. 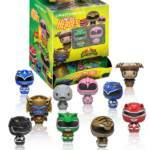 Finally, we have the Funko Dorbz featuring the original five Mighty Morphin Power Rangers and Rita Repulsa. More information will be coming soon on these items – including some exclusive variants – so stay tuned. Check out all the images by clicking the title of the story and then join in our discussion of these new items. If you’re a fan of Mighty Morphin Power Rangers it continues to be a great (and expensive) moment in history for you! Heads up to those of you collecting FunkoPOP! figures. Our buddy @ZeroFlame16 on Twitter pointed us to the Reddit thread for FunkoPOP! collectors – and showing up today is a Hot Topic exclusive. The Metallic Mighty Morphin Red Ranger, with Ape Power Coin Emblem, is part of the December reveal. 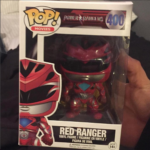 › Companies: Funko › Characters: Mighty Morphin Red Ranger › Toyline: FunkoPOP!